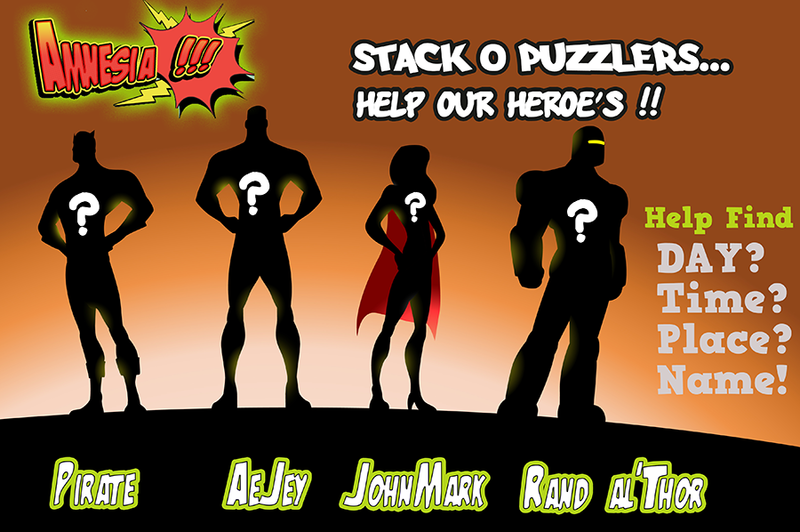 Our Stack O' Puzzle Heroe's have amnesia! It happened last night, when each one of the puzzle heroes' arch-nemesis defeated them all by giving them all AMNESIA! They all lost their brilliant puzzle solving skills. The heroes cannot remember anything, including who they are! In a rare showing of compassion, each of their enemies has given them a chance to regain their memory, along with their brilliant puzzle solving skills. Each hero is to meet their arch-nemesis at a certain place, on a certain day, at a specific time. 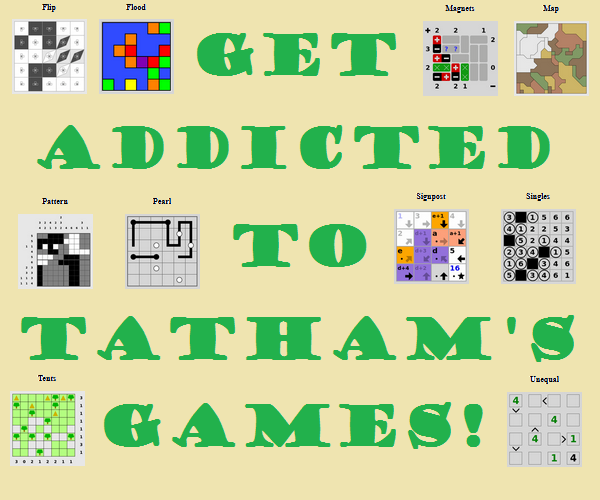 The puzzle world is in total chaos until this information can be deciphered. They need you. 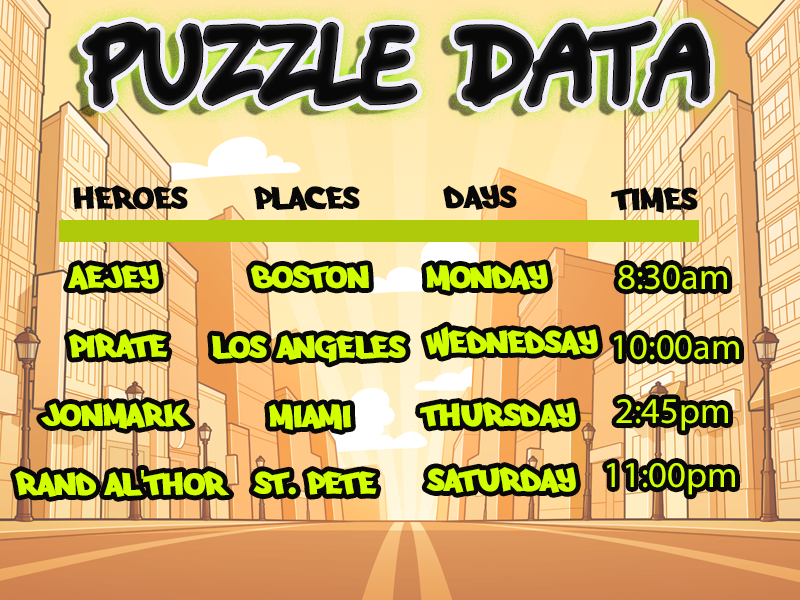 Clue 1: JOHNMARK who doesn't live in a warm climate, is supposed to meet 8 hours and 15 minutes after one of the other heroes. Clue 2: Both PIRATE and RAND Al THOR are meeting in Florida but neither meeting in the southern most city and neither are supposed to meet at the earliest times the villains specified. Except clue 2, where @Alconja has pointed out a couple of problems: "I don't see how Pirate & Rand can both meet in Florida (Miami or St. Pete), but neither in Miami (southern most). Surely that makes them both St. Pete..."
Now, if you look at clue 4, it appears to be redundant: clue 2 says Randal is in Florida, clue 3 says the California meeting is at 1445. Then clue 4 says that Randal is not meeting at 1445, which would follow from the previous two, since California is not Florida. Right? Unless... California has been annexed by Florida. Now the contradiction in clue 2 is resolved and clue 4 is not vacuous. No doubt the villains are behind this annexation. But they'll never get away with it! !